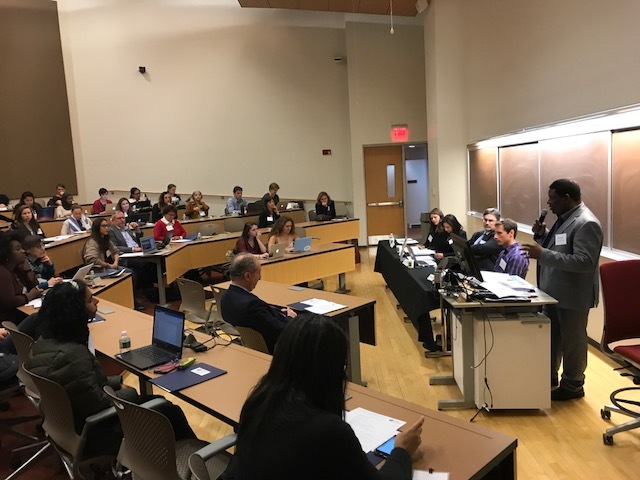 On December 7 & 8, the Program on Human Rights and the Global Economy (PHRGE) held its 12th Human Rights Institute at Northeastern University School of Law (NUSL). The two-day event, entitled “Land Rights in the Era of Land Grabbing: The Land Tenure Security Index” was based on the work of Visiting Scholar, Alfred Brownell, a Liberian human rights and environmental lawyer. After a warm welcome from NUSL Dean Jeremy Paul, Brownell opened the Institute with a powerful call for attention to the global problem of insecure land rights. For PHRGE’s land expert, in both rural and urban environments, it is difficult to secure any basic rights without secure access to land. He included in his answer to the question, “Why land rights?” a request for a moment of silence in memory of human rights defenders killed in 2017 defending the land rights of vulnerable communities. From there, the Institute held two expert panels, designed to educate participants on key land rights issues and introduce the idea of a land tenure security index. The first, entitled “The Advocacy Power of Social Indexes” was moderated by Jonathan Kaufman, Executive Director of Advocacy for Community Alternatives and included presentations by: Malcolm Childress, Co-Director of the Land Alliance, and head of its (PR)Index Project, Irit Tamir, Advocacy Manager at Oxfam America, Nicolas Tagliarino of the Land Portal Foundation (participating remotely from The Netherlands), and Chloe Ginsberg, Tenure Tracking Associate at the Rights and Resources Initiative. The panel established that there are a variety of organizations gathering and organizing invaluable information on land tenure, and pursuing their own strategies to get this information to the people whose land rights are under threat. Ms. Tamir’s described her organization’s “Behind the Brands” campaign, which created a social index to compare the land tenure sensitivity of several globally-prominent food and beverage brands. The campaign made sure that its index rested on credible information, organized and presented in a transparent and accessible way. By delivering this information to the companies, the press and Oxfam America’s own constituencies and allies, the organization was able to leverage important changes in some company policies, most notably the land tenure protection policies of Coca-Cola. The second panel was designed to discuss the challenges and opportunities facing efforts to create a land tenure security index. Professor Shalanda Baker of NUSL and Northeastern’s School of Public Policy, moderated presentations by Independent Land Tenure Specialist, Liz Alden Wily, Téodyl Nkuintchua Tchoudjen, Regional Technical Advisor, Citizen Voices for Change: Congo, Ward Anseeuw, Knowledge, Learning and Innovation Senior Technical Specialist (joining remotely from Rome), International Land Coalition and Peter Veit, Director of the Land and Resource Rights Initiative, World Resources Institute. This panel built nicely upon the foundation created in Panel One by providing information about more projects designed to gather and disseminate tenure-related information, while giving more attention to the challenges in the work. Mr. Tchoudjen, a Cameroonian national with long experience in the land sector, across the African continent, described the fascinating experience of a network of African organizations that set out to create a “land tenure index” with a focus on making the information it gathered relevant to organizations and organizers directly engaged in land struggles and efforts to reform land laws. They succeeded in gathering a great deal of information, but, due to resource limitations, were unable to take the next step of making that information accessible to directly-affected communities. One could not witness these two panels without being impressed with the technical achievements of projects such as the International Land Coalition, which has documented and analyzed over 200 land-relevant indicators in ten categories, or the Landmark Initiative of WRI and others, which has achieved detailed maps of the state of indigenous land holdings around the world. At the same time, the relative lack of collaboration among these projects was equally notable, as was the recurring problem of how to make the extraordinary cache of data available accessible to people faced with dispossession. Chris Jochnick of Landesa, topped off the first day with a magisterial keynote speech entitled, “Land Rights is the Human Rights Issue of the 21st Century.” Jochnick drove home the close connection between land rights debates and the human rights concern that drives PHRGE’s mission. Using examples from around the world, Jochnick reinforced the sense of urgency around land rights that had been building throughout the day. He also described the progress of efforts to define and recognize a human right to land within the international rights framework. In a global scenario that does not always inspire confidence, Jochnick highlighted points of light that serve as the basis of his optimism that the problem of land rights can be addressed effectively through civil society empowerment and collaboration, as well as thoughtful engagement with state authorities. In a lively question and answer session, participants encouraged Jochnick to address more facets of the land question, while questioning some his ideas, such as the contention that positive engagement with government at all levels is, in fact, a viable strategy, in most cases. The discussion provided the perfect capstone to a fulfilling day. Day Two began with an information side meeting to discuss the possibility of bringing more financial resources to the support of land rights work. 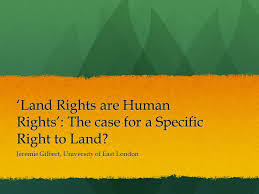 Participants noted that, if the general contention of this Institute regarding land rights and human rights was correct, then the human rights funding community might be a good location for a fruitful analysis of the resource requirements of effective land rights work. 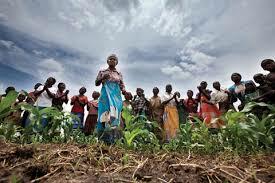 To date, land rights work is not a high priority of such funding agencies, and the participants were not aware of any donor affinity group with the mission of promoting such discussion among human rights funders. Participants agreed to work together to develop a rationale for more involvement in the land rights sector by human rights philanthropy, and to pursue the possibility of proposing panels at appropriate funder convenings to discuss this issue. Day Two of the PHRGE Institute brings together a smaller group of academics, advocates and activists to work intensively in a workshop format to make progress on some of the issues raised in the Day One panels and keynote. In the case of this Institute, PHRGE had put forth some ideas of the way forward to developing more effective land rights advocacy tools using existing information in new ways. As he had on Day One, Alfred Brownell opened Day Two by introducing the objectives of the day and describing PHRGE’s plans around the organization and facilitation. The 30 participants in Day Two, who included nearly all of the panelists from Day One, decided to stay together as a group, rather than break up into small groups. The morning was time for a wide-ranging reflection on land rights advocacy and the gaps in the projects described and discussed on Day One. Since one of the things the PHRGE proposal suggested as a next step was some form of ongoing collaboration on improving tenure tools, the afternoon discussion focused on this issue of next steps, as well as the ever-present issue of how all of this amazing information becomes relevant to the real lives of people struggling to hold onto their land. The idea of “co-creation,” or involvement of end users in the design and creation of tenure tools from the very beginning emerged as a potential improvement over the approach of developing the tools and then working to make them relevant to very concrete land disputes. Liz Alden Wily focused the discussion even further with her own assessment of the possibilities of developing a new type of tool on the basis of an assessment of the value of existing indicators. Jonathan Kaufman questioned the connection between this apparently “technocratic” approach to manipulating existing indicators, and the commitment to co-creation, and Malcolm Childress responded that this apparent contradiction was actually the huge opportunity. This entry was posted in Uncategorized and tagged Africa, Human Rights, Land Reform, land rights, Landesa, Northeastern University, Oxfam America, Rights and Resources Initiative, World Resources Institute. Bookmark the permalink.